Corroded though storage in a hostile atmosphere (e.g. moisture + exhaust fumes), the pot shafts and sockets are badly effected, but the cadmium-passivated (gold colour) plated steel chassis is as good as new. The standard footwitch was not detachable from the head. Speakers measure 1070mm high x 200mm deep x 460mm wide. 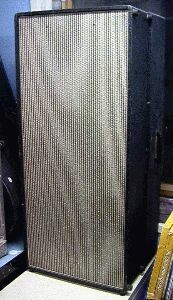 Speaker Cabinets weight approximately 20 kg each. The cabinets themselves were manufactured by Hancock & Gore (Bulldog series). 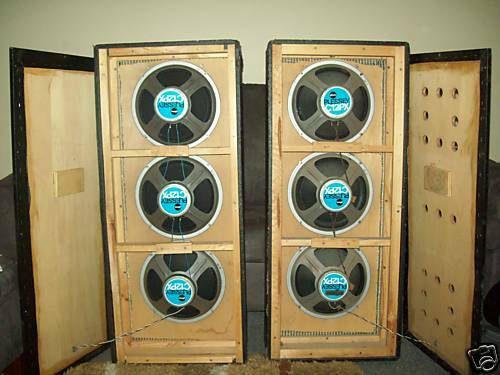 Sound comes via 3 x Plessey 12” C12PX speakers to each cabinet (6 in total). The speakers are in excellent condition with no rips, tears or holes. The front mesh is classic 60's fabric. Both have small nicks, one cabinet has the top corner worn off. The covering is showing signs of age with some nicks and cuts. Handles are made from classic bakelite. The goldentone badges are made from steel. One has a break in the middle and has been fixed with a screw. Fully restored! Rare and distinctive. 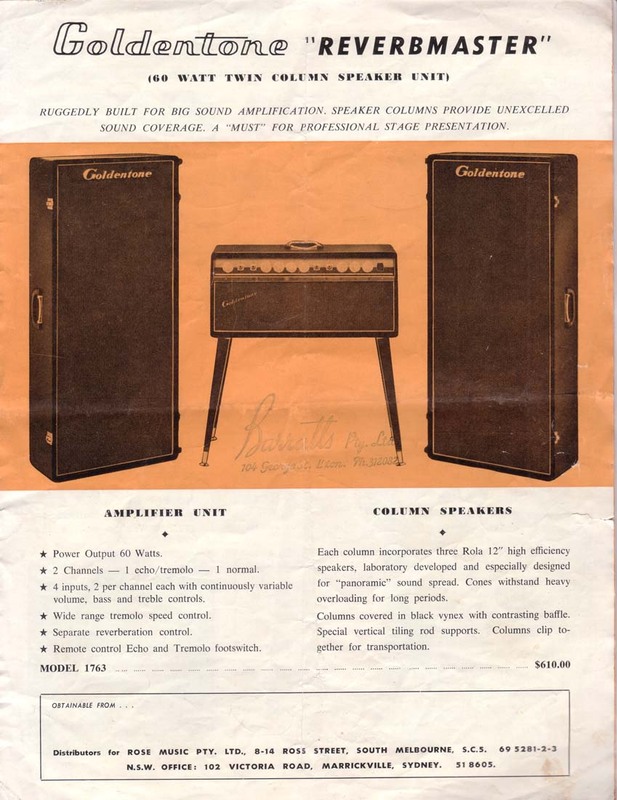 Rose Morris was a Melbourne company that built amplifiers for the likes of Goldentone, including the 'holy grail' of Goldentones, the 2x12 Twin combo. Yes, in effect this is a straight Goldentone head - same output valves, same componentry, same grouse tone! 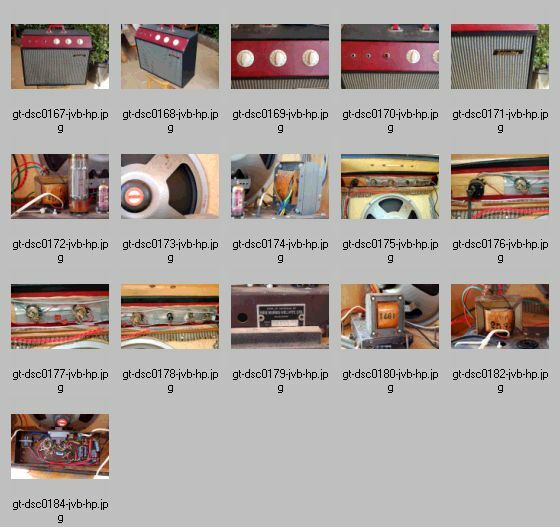 These notes are courtesy of the amp's restorer in South Australia. Here is a great Rose Music Co 40 Watt RMS Valve Combination Amplifier. Another of our fine amps, this unit has been maintained and overhauled meticulously and is presented in the finest working condition. Rose Music built Amps for many people, this one for Communication Systems of Australia (CSA). As can be seen from the pictures, it is in wonderful condition. Rose Music Pty Ltd, a family owned manufacturer first imported Yamaha products in 1961, sole Australian importer. In 1986 Yamaha Corporation purchased Australian distribution rights from Rose Music and Yamaha Music Australia was born. Yes this amp was built by Rose Music, the beginnings of Yamaha in Australia - truly a wonderful piece of Australian valve history! All better than new book specifications, a wonderful suite! ...so there are two fine outputs to keep you going for many a year. I have even included a good spare 6DQ6 for the final, and is plugged into the spare socket. 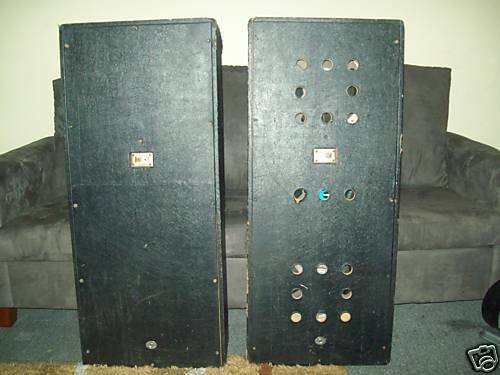 If you feel that there is too much gain for your liking with the 12AX7's, I will include a nice pair of Philips/Mullard 12AU7's to substitute the 12AX7's. 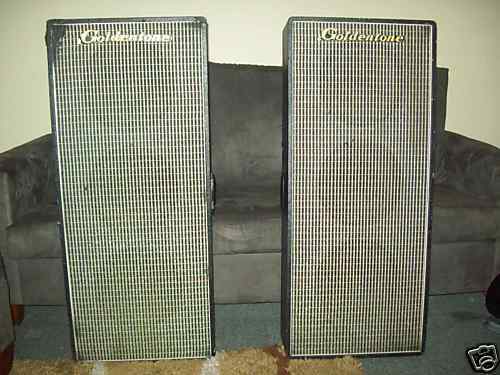 I'm sure we all have differing tastes when it comes to valve amplification. (Substitution is the 2 x 12AX7 valves furthest away from the 2 finals 6DQ6A's). This unit is a fine performer of the 1960s, supplying standard 6mm jacks for Rhythm or Lead Guitars, plus a Microphone input. The unit has two stages of Pre-Amp, using separate triode sections from two of the 12AX7's, each having their own input control from the front panel. A 12AX7 is also used for the phase splitter. A nice combination unit. This is truly another of the gems from the 60s. The output stage, which incidentally is identical to the Playmaster Amp also on sale here, operates under push-pull class AB1, fixed bias conditions, a mode which avoids grid-drive problems,ensures good power supply economy, and which minimises cross-over distortion. The total harmonic distortion incidentally at 36 watts output, is less than 1%. Load impedance: 8 Ohms. The unit will pack at approximately 11Kg - you can blame that on those quality A & R transformers! The only mystery here is who threw it on a hard rubbish collection? The good news is that it was spotted by someone driving by who now has a Goldie bassmaster in a homebrew case as a reward for being observant. 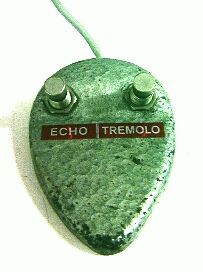 Other pix and the full story on Aussie Guitar Gear Heads forum. A find like this is quite valuable for any amp builder because you have the two most important components in a valve guitar amp, the power transformer, and the output transformer. The HT choke, chassis, and any other bits are a bonus, but the trannies are the real find and value. Note the milky gettering in the top of the preamp valve in front of the output transformer, indicating that it has lost vacuume - it should be silver-grey like the one at right.